It’s hard for many to imagine a time when “hockey” and “California” were never used in the same sentence. The quality and quantity of talent coming out of California continues to increase at a rapid pace. This seemingly sudden explosion in popularity of the sport may be attributed to initiatives such as the Anaheim Ducks Learn to Play program, which gives children and adults the opportunity to try the sport for free. It could also be due to superstars like Ryan Getzlaf, Ryan Kesler and Corey Perry bringing their talent to the state, or the fact that between the three NHL clubs that call the Golden State home, there are now three Stanley Cups. As the sport of hockey has grown and gained more popularity here in California, The Rinks created a tournament which is unlike any other, combining both the ice and inline side of the sport. 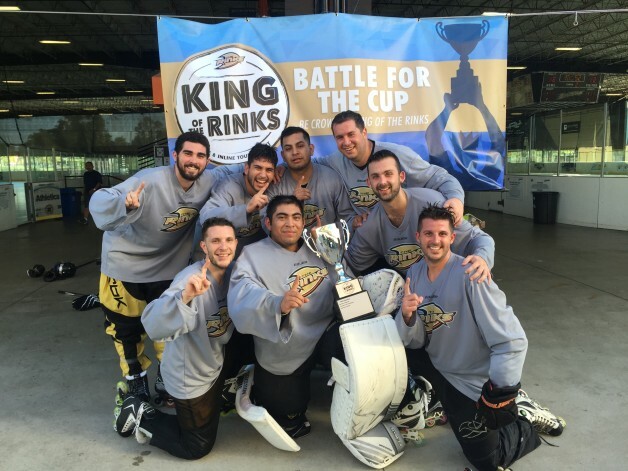 The King of The Rinks tournament is back for its third straight year at The Rinks-Anaheim ICE and The Rinks-Irvine Inline. Over the July 23-24 weekend, players from all over the state will hit both the ice rink and inline rink to show that their team has what it takes to be crowned King of The Rinks. This hybrid ice and inline tournament allows players to see how their skills stack up against the rest of the California hockey community. However, unlike most tournaments, participants will need to prepare for both ice and inline games. Here in California, the hockey community rallies behind both forms of this great game and The Rinks want to see which teams truly are the most well-rounded. The tournament features youth and adult divisions, and a four-game guarantee (two ice, two inline) with the championship game being played as an inline game. When asked about last year’s tournament experience, The Rinks marketing associate Craig Appleby said, “King of The Rinks is a great tournament and The Rinks does a great job hosting it. When I first heard about the idea of an ice and inline hybrid tournament, I was extremely excited because I had played inline when I was younger and transitioned to ice later on. The third annual tournament will feature three new divisions. Adding to the three youth divisions already in place, this year will introduce a High School division for birth years 1999-2003. With the explosion in popularity of the Anaheim Ducks High School Hockey League, now in its eighth season and consisting of 48 teams, this is a great opportunity for high school players to get on the rink with their teammates and have fun before their season gets underway. On the adult side, The Rinks is opening up both a Rookie and an Over 40 division. Grass roots initiatives like the Anaheim Ducks Adult Learn to Play program have enabled adults to experience hockey for the first time and get into the game. The Rinks runs Over 40 leagues and wants to give players the opportunity to compete in a tournament atmosphere without having to worry about those young ringers buzzing around. Participants may register as individuals (free agents) or as a team. For more information and to register for King of The Rinks, visit the tournament website at www.the-rinks.com/kingoftherinks.